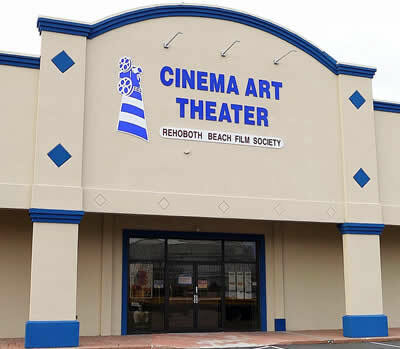 Cinema Art Theater (CAT) is located at 17701 Dartmouth Drive, Lewes, (in the Dartmouth Plaza off Route 1 behind the Lewes Wawa) (map). Accessible entry, concession area, and restrooms. Tickets can be purchased at the door 30 minutes prior to screening. Visa, MasterCard or cash payments accepted ($100 bills are not accepted). Check individual screenings for member and general admission prices. Tickets are non-refundable and non-transferable (unless the screening is cancelled by the Rehoboth Beach Film Society). Late arrivals – For safety reasons and to prevent disturbing viewers, entry to theaters is not permitted after a film has started. Doors open 30 minutes prior to each screening so please arrive early. Inexpensive snacks and beverages are available for purchase with cash only. Food and beverages (including water) purchased outside of the Cinema Art Theater are not permitted. Please inquire for available devices at the ticket sales desk. Smoking is not permitted anywhere on the premises, including the theaters, restrooms, and lobby area. No cameras or other recording devices may be used during film screenings. To prevent disturbing other viewers, please turn off all electronic devices (cell phone, tablet, beeper, etc.). Please remove and deposit all trash in the waste or recycling receptacles as you exit the theater.